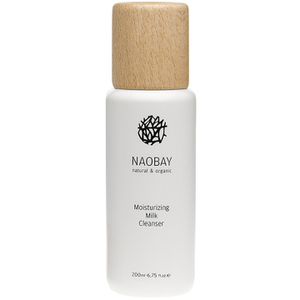 Gently refresh your complexion with the Moisturising Milk Face Cleanser from NAOBAY (Natural And Organic Beauty And You). Catering specifically for dry and sensitive skin types, the luxurious formula eliminates daily impurities and make-up without stripping moisture. A nourishing blend of Olive Oil, Gotu Kola and Sweet Almond Oil protects the skin's hydrolipidic film from environmental aggressors, whilst restoring natural elasticity to reveal a touchably soft, supple complexion. Skin is clear, comfortable and hydrated. Apply to a damp face and massage in using small circular motions. Rinse. Aqua, Aloe Barbadensis Leaf Juice*, Coco-Caprylate Caprate, Caprylic/Capric, Triclyceride, Olea Europaea Fruit Oil*, Propanediol, Potassium Olivoyl Hydrolyzed Oat Protein, Cetearyl Alcohol, Glyceryl Stearate, Prunus Amygdalus Dulcis Oil*, Stearyl Alcohol, Glycerin, Centella Asiatica Extract*, Glyceryl Oleate, Benzyl Alcohol, Potassium Sorbate, Sodium, Benzoate, Dehydroacetic Acid, Xanthan Gum, Parfum , Citral, D-Limonene, Geraniol, Linalool. The product appeared to be really oily when apply to the face. I wonder are we able to get a refund due to this dissatisfaction? i love this product. feels really nice and feels very safe on my face.